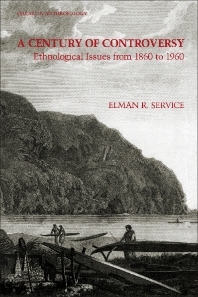 A Century of Controversy: Ethnological Issues from 1860 to 1960 is an assessment of the history of ethnology in terms of its intellectual progress, with emphasis on the controversial issues that were broached between 1860 and 1960. Two related philosophical or theoretical poses that characterized the prominent ethnological thinkers of this period, and earlier, are related to this phenomenon. One was the prevalent positivism, the other the belief in human progress as a form of social, cultural, and mental evolution. Comprised of 19 chapters, this volume begins by looking at several eminent scholars dealing more closely with the subject of ethnology, including Henry Maine and John F. McLennan in Great Britain; Johann J. Bachofen in Switzerland; and Fustel de Coulanges in France. In particular, the chapter examines the disagreement among Maine, Bachofen, McLennan, and Fustel de Coulanges as to the nature of the earliest society and its form of marriage; the nature of the evolutionary transformations of society (especially from primitive society to civilization); and the actual meaning and function of kinship terminology. The next two chapters describe the positive, useful discoveries as well as the mistakes and weaknesses of Lewis H. Morgan's work, with particular reference to his classificatory kinship nomenclature. Subsequent sections focus on controversies surrounding kinship terminology; social structure; the origins of government; the economic life of primitive peoples; and society and culture. This book will be of interest to scholars of anthropology, archaeology, and ethnology. 4. Kinship Terms: Biological or Social? 5. Kinship Terms: Mind or Society? 9. What Are Descent Groups? 10. Totem and Taboo: Society or Mind? 15. Economic Exchange and Allocation: Maximization of What? 18. The Locus of Cultural Reality: Is It in the Mind or Is It an Entity sui Generis!